It’s very important to have a healthy smile – but what about teeth that look wonderful too? If you’re dissatisfied with your facial appearance, contact our Columbia, MO office today to schedule a consultation with cosmetic dentist Dr. Philip Batson. We offer several services that can transform your look for the better, erasing common flaws like stains, gaps, misaligned teeth, broken or decayed teeth, and much more. Our team wants to help you feel fully confident about your smile! Unlike metal fillings, tooth-colored fillings offer patients increased aesthetic quality, more conservative treatment, and more overall comfort. Learn more about tooth-colored fillings. Everyone deserves to improve their smile’s health and structure in a beautiful fashion. With crowns, inlays, onlays, and other restorations made of high-quality ceramic materials, you can get back to enjoying a completely natural smile faster than ever. Learn more about all-ceramic restorations. In-Office Whitening – If you want to achieve amazing changes in a short timeframe, our in-office procedure could be right for you. With the help of a high-grade whitening gel, your enamel can be lightened several shades in a single hour. Take-Home Whitening Kits – Patients who’d prefer to improve their smile at a more controlled pace may enjoy our customized take-home kits. Our Columbia team will provide you with the oral trays and whitening gel, and all you have to do then is wear both together each day for a small amount of time. Within a couple of weeks, your smile will be significantly brighter. Opalescence® – This state-of-the-art technique is a new special here at Columbia Healthy Smiles, and we know you'll be impressed with the results. We have three treatment options including take-home, custom trays or in-office. Contact us to find out more. A veneer is often the ideal cosmetic solution for patients who’d love to correct a variety of aesthetic flaws all at once instead of having to undergo multiple, time-consuming procedures. This thin shell of dental porcelain is designed to closely match the natural shade and translucent quality of your teeth, and Dr. Batson can even design them to correct the length or shape of certain teeth, depending on your input. The quality porcelain material is even more resistant against staining, allowing you to maintain your gorgeous look longer than ever. The process for receiving a dental veneer typically requires two to three appointments. First, we’ll discuss what you hope to accomplish with the cosmetic procedure, following by the preparation of the teeth and impressions. Our Columbia, MO team will also provide you with a temporary veneer so that you can become accustomed to their look and feel. Once we’ve received the final product, you’ll be brought back so Dr. Balson can fit it securely in place and ensure your complete satisfaction. Many adults wish they could achieve a straighter smile later in life, but the idea of wearing metal braces in the professional world is just too much of a hurdle. 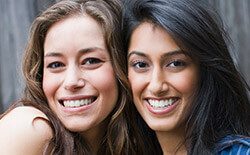 Thankfully, you can find an alternative solution here at Columbia Healthy Smiles – Invisalign. This orthodontic treatment relies on a series of clear, customized plastic aligners that are virtually unnoticeable when worn. All patients have to do is wear each one for a certain amount of time before moving to the next. Regular check-ups with Dr. Balson will allow him to make sure you’re progressing smoothly. And that’s it! Within 8-18 months, you’ll have achieved a straighter smile in a virtually seamless fashion. Contact our Columbia practice today to schedule an Invisalign consultation.